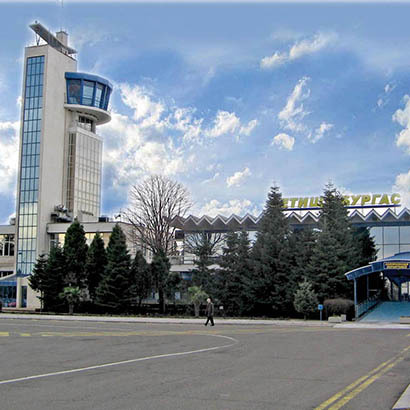 Bourgas Airport is situated in a picturesque bay on the southern Bulgarian Black Sea coast, 10 km north-east of the city of Bourgas which ranks second among Bulgarian municipalities by its well-developed industry. Its specific geographical location – on the border between Europe and Asia, has contributed to its strategic importance for the new relationships in the modern world. The potential of Bourgas Airport for handling passengers and cargo has a strong effect on the development of a transport network, tourism and trade between partners from the East and the West. Bourgas Airport has been built on an area of 2 532 000 sq m, including a cargo centre as well. It has a 3 200 m runway capable of receiving the heaviest types of aircraft such as Boeing 747 Jumbo Jet and An 124 Rouslan. One of the greatest strengths of Bourgas Airport is the excellent opportunity it provides for intermodal transportation by air, sea and land – Bulgaria’s busiest Port of Bourgas, an important railway junction, the E 87 international motorway and Trans European Corridor № 8 are all located just 10 to 15 km away from the airport. The mild climate and the meteorological conditions in the region ensure excellent visibility throughout all seasons and 24-hour operation of Bourgas Airport all the year round. Within a 30 km radius of the airport are situated the attractive seaside resorts of Slunchev Bryag (Sunny Beach), Nessebar, Elenite and Dyuni, etc. The tourist season lasts from May till October, thus ensuring steady leisure traffic during this time of the year.